Modifiers allow merchants to modify an order (i.e. : add mayonnaise, no tomatoes, etc). After editing an Item in the Inventory, select Modifiers next to Item Details. Only modifies one specific option, such as Size. 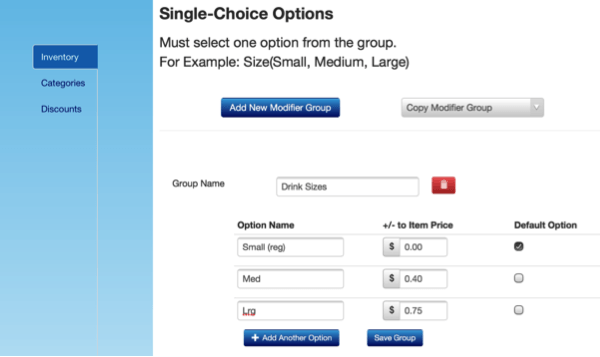 In this example, a customer can only select Small, Medium, or Large. Only one of these options can be applied to an item. Add-On options are used to add sub-items to an item. This set of options would work well for a hamburger. 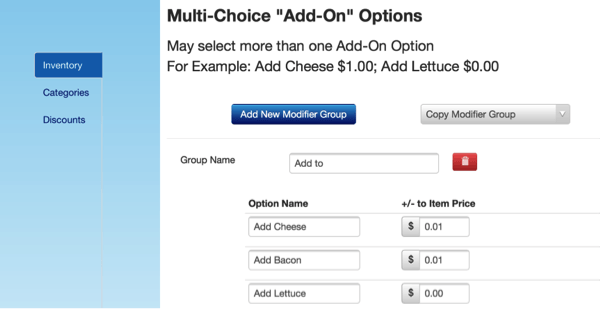 You can set up options of cheese, bacon, lettuce, tomato, and more that can be selected for that item. Multiple add-ons can be applied to the same item, and you can add an additional charge for specific add-on items. The No options are used to refuse sub-items on an item. For example, you can set up no lettuce, no onions, no mustard for a hamburger. 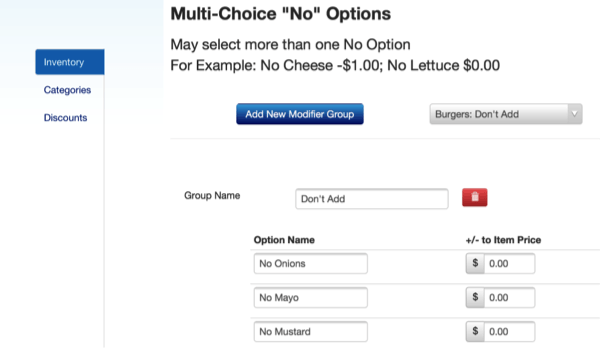 Multiple no options can be added to an item, and the charge can be altered for specific options. For example, if someone orders a burger with no cheese or onions, you may subtract $0.25 from the price of the burger, but not subtract anything for the onions.